Dr. Oscar García Pañella holds a B.Sc. degree in Telecommunications, besides a M.Sc. and Ph. D degrees in Electronic Engineering, respectively, in 1995, 1998 and 2004, from La Salle School of Engineering in Ramon Llull University, Barcelona, Spain. His main Ph. D topic was an automatic simulation of deformable objects applied to Telemedicine, partially granted by the EPSON Ibérica's "Rosina Ribalta prize" for the best pre-doctoral project (1999). He's enjoyed several stages abroad, like at the IMSC (Integrated Media Systems Center, University of Southern California - USC, Los Angeles, California, USA, 1998), at the VIS Lab (The Henry Samueli School of Engineering, University of California at Irvine - UCI, 2005) and at the Entertainment Technology Center (Carnegie Mellon University - CMU, 2008-2009). In these, he has worked on the implementation and design of Applied Games and Interactive Installations intended to solve several simulator-related challenges and learning opportunities from the “experiential multimedia” and “learning-by-doing” views. Oscar directs the Videogame Degree at ENTI-UB Barcelona besides the online the Gamification & Transmedia Storytelling Master Program for the IEBSchool. He also teaches several courses such as Game Design, Gamification, Interactive Design, Programming, Videogame History and Algebra within several additional universities (ERAM, UOC, Blanquerna-URL, etc.). In addition to that, Oscar works as a senior Gamification consultant for Cookie Box, as a way to bring the fields of Transmedia and Dramanagement to the Human Resources Departments. He also operates the ProMultimedia Association which is currently composed of the 7 major universities providing with Multimedia-related & Videogame studies in the country, besides directing the NextGen local Initiative within the TEA Association while belonging to its international board. 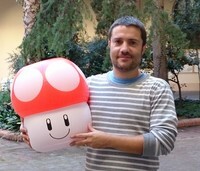 Oscar is one of the PI’s in the GameWise Leonardo Research Project funded by the EU (2012-2014).